Houses and shops in Southwark's Flat Iron Square, south London, were lit up in time to the music of the Canadian electronic producer, whose real name is Joel Zimmerman, who took to the decks in his trademark costume mouse head. The 31-year-old kicked off the night, to launch two new Nokia Lumia handsets, by riding a motorcycle behind bins that lit up on top of a roof. "Thanks for tuning in folks! Was a bit chilly, but we had a great time :) Been up since 4am... Going to bed now at 4am. Tired mau5 go night night now. Thank you London!" he tweeted after the gig. In an interview with his tattoo artist girlfriend Kat Von D, he admitted: "I love this place. I would give it 8 out of 10. I've got to say, one point's deducted for the weather. Not good! They lose another point for the food." 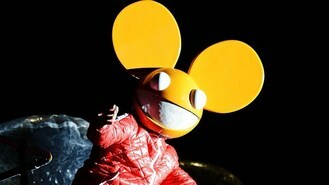 The show follows the success of last year's collaboration with Deadmau5 and Nokia at Millbank Tower. "This show is a totally different concept from last year but equally inspiring and technically challenging," said Deadmau5.